Two estranged brothers are forced to take a surreal and heartfelt journey to understanding, when they pick up the body of their deceased father in Mexico. A father they haven’t seen in over 20 years. ...this first feature by a young Chicago born director named Bryan W. Simon is an astonishing thing to behold and ...nothing in this inventive and stubbornly offbeat little movie is predictable. Bryan Simon knows how to make movies, and how to make them work. He shows a remarkably sure and resourceful hand for a feature debut and knows where he's going and gets there with skill and imagination. Bryan W. Simon's compelling film is one of the ones to watch. 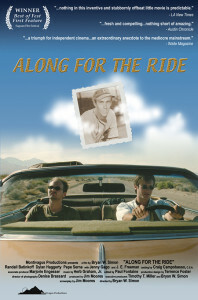 Along for the Ride is a triumph for independent cinema...serious, satisfying, and, in actuality, funny. …fresh and compelling, nothing short of amazing.